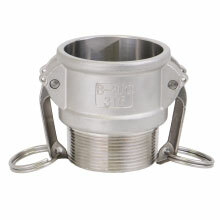 Part B is used in various Agriculture and Industrial liquid flow applications. Part B is available in traditional glass injected polypropylene, polypropylene FDA Grade, and/or stainless steel materials. 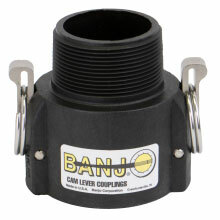 Part B is Female Coupler x Male Thread. 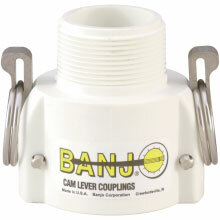 Also look for Cam Lever Coupling versions that include Locking Arms, 90°, and 45° designs. Liquid Handling Products Inc. specializes in systems for above and below ground liquid handling applications for the industrial, agriculture and municipal markets. The primary industries which we serve are manufacturing, agriculture/produce, beverage, chemicals, electronics/plating, pharmaceutical, nuclear, paint/ink, food, dairy, pulp and paper, recreation and water/waste treatment plants. We can assist you in developing a turn key system or provide component parts to your existing system. Be assured that our products whether it is tanks (stainless, fiberglass, or plastic) pumps, valves, piping, spray systems, gasket materials, safety equipment, and our service and fabrication department are the finest in the industry. We take great pride in distributing and representing only the best and proven manufacturers in the field of liquid handling. Let our 50 years of experience help lead you through whatever situations or applications you may have. We ship liquid handling products anywhere around the world.